Please note that My ID Score has been discontinued and is no longer available. You can read our old review of My ID Score below, or check out the rest of the Identity Theft Protection Services we've reviewed. 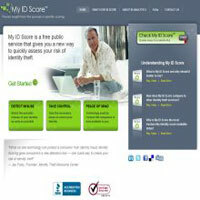 My ID Score is an innovative service, based in the US that provides a quick and easy way to examine your risk of becoming a victim of identity theft. Perhaps the most exciting part of My ID Score is that it is a public service, available to all US citizens, completely free of charge. It works along the lines of an ID 'Health Score' (as offered by other Identity Theft Protection Services), providing an indication of your personal level of risk. Unfortunately, as a US public service, it is limited to citizens of the US, and so other users will have to look elsewhere to find similar services that they can use. My ID Score is extremely simple to use - just fill the short registration form, provide the requested details in connection with your credit and debit cards, bank accounts and mortgage, and then the technology that powers My ID Score will return a statistical figure, based on your entries. The technology that makes My ID Score so successful, is the 'ID Network' technology, used by many Fortune 100 companies in order to assess their own risk (and that of their staff) of becoming a victim of some form of data related fraud. The technology provides users with a real-time indication of their level of risk, and the test can be an unlimited number of times, so that users can take action to reinforce their personal security, and then retest to check whether their actions have actually improved their score. These scores are extremely easy to understand, too - the lower your score, the lower your risk of becoming a victim of identity theft or associated fraud. What's even better, is the service also puts users in touch with other services, companies or local specialists who may be able to help them if they are concerned by a particularly high score. It is notable, that compared to some of the other services we have reviewed in this category, the service offered by My ID Score is essentially limited to this one purpose of providing the ID score. If users are looking for a service that will provide a number of additional features (such as wallet protection, for example) then this free service is not ideal for them. If, however, you are interested by this service and would like to give it a go, click on the button below to find out more about MyIDScore.com. Alternatively, if you think you're looking for a more comprehensive service, why not try LifeLock, our highest rated service in this category. Please note that My ID Score has now been discontinued.